Snap-on Tools franchise complaints and issues have given rise to a humorous, biting Snap-on parody site called Crap-on.Com. 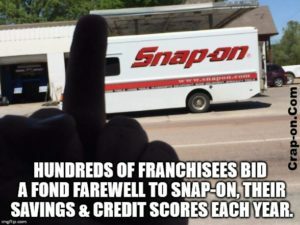 (UnhappyFranchisee.Com) Snap-on franchise parody website Crap-on.com states that, in April, 2016, the Snap-on Inc. (NYSE: SNA) board of directors announced that it would be issuing yet another stock dividend. That means that Snap-on Inc. (NYSE: SNA) has paid stock dividends every quarter since 1939. Crap-on.com asks: What is the secret to the success of Snap-on Inc.? According to Crap-on.Com, written as if its an official Snap-on promotional website, the reason for Snap-on’s success is a previously secret internal program called the Crap-on Dealers Program. Screw Drivers Key to Snap-on Success (PDF). Snap-on Franchise’s Crap-on Dealer Program: Add Your Praise! The site states that, in this time of fervent nationalism, Nicholas Pinchuk (known affectionately at the home office as Nicky Pinchy) wants Snap-on to be recognized for not outsourcing, like other manufacturers. Check out the website at http://crap-on.com/ and let us know what you think. SNAP-ON TOOLS Franchise Dealer Warns: Buyer Beware! ARE YOU AN SNAP-ON FRANCHISE OWNER OR DEALER? ARE YOU FAMILIAR WITH THE SNAP-ON FRANCHISE OPPORTUNITY? SHARE A COMMENT BELOW.